Jordan is likely to join the US-led coalition fighting ISIS, a source told Arab media Thursday. Jordan is likely to join the US-led coalition fighting ISIS, a source told Arab media Thursday. 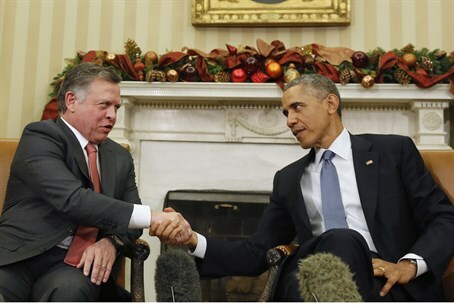 According to the source, King Abdullah, who was visiting the US when a Jordanian pilot was killed two days ago by ISIS terrorists, discussed Jordan's joining the coalition with US President Barack H. Obama. The report said that Jordan was gearing up for a “flash attack” on ISIS positions in Iraq. The attack, it is hoped, would disable at least part of the terror group's operations. After that attack, Jordan will discuss a more orderly role in the coalition, the report said. On Wednesday, Jordan executed two terrorists, including would-be Iraqi female suicide bomber Sajida al-Rishawi and Iraqi Al-Qaeda member Ziad al-Karboli. ISIS had demanded the release of al-Rishawi in lieu of a $10 million ransom in exchange for the life of Japanese reporter Kenji Goto. The Japanese hostage was executed four days ago, after talks between Jordan and ISIS broke down, and, as a “punishment” to Jordan, ISIS on Tuesday executed Maaz al-Kassasbeh, the Jordanian pilot it has been holding for over a year, after he was captured when his plane was shot down by ISIS militants. According to Jordanian state TV, the 26-year-old pilot was actually killed exactly a month ago, on January 3. Just a week before that another Japanese captive, Haruna Yukawa, was likewise beheaded by ISIS. Goto had entered Syria as part of a humanitarian effort to document the situation of residents, and also to try and locate the captive Yukawa and free him. Meanwhile, the United Arab Emirates said that it was dropping out of the anti-ISIS coalition. A senior US official said Wednesday that the UAE has actually not participated in actions against ISIS since December, after the Jordanian pilot was captured by the Islamist terror group.